I absolutely loved being pregnant. I love the last few week's of going to bed wondering "will this be the night" that baby decides to make an appearance. The phone calls and text to family and friends to announce that all is well and the baby has arrived safely. I didn't get this with Martha Grace. I wanted to be able to enjoy my third and final pregnancy, I think what I looked forward to the most was introducing Osh and Isabella to their new baby sister - to see them running into my Hospital cubicle and jump all over me before smothering her in kisses...the next day they'd wait patiently for Mammi and Daddy to bring her home to them. "The first few days with a new Baby are magical, life is perfect. There is a constant stream of visitors bearing gifts, hours spent gazing at your beautiful newborn fast asleep in their very own Moses basket or in your arms and if you're lucky enough to get any sleep yourself - you will be in your own bed. 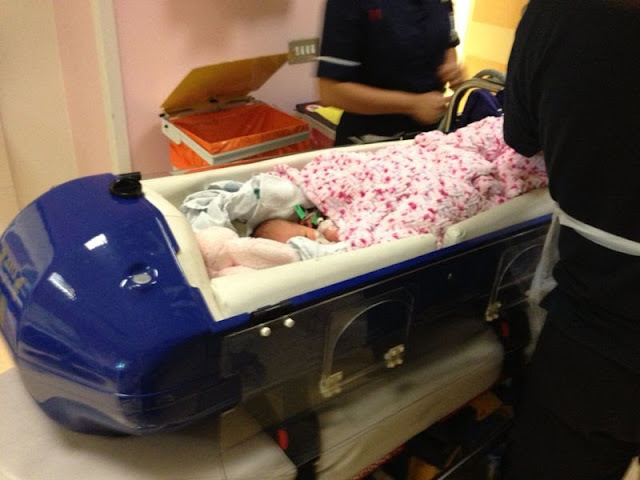 When she cries in her incubator I can't just lift her out for a cuddle - I have to gently stroke somewhere on her body (that isn't covered in sensors or wires) and just hope that she feels some kind of comfort from my touch. I realise that we are very lucky she is alive, and that we've come all this way to give her the best chance of life...but it doesn't make it any easier, especially when you've only.given birth three days ago and your.hormones are chaotic." If you haven't already read Martha's Birth Story - you can find it here. Of all three of mine, Martha's Birth was the calmest. If Martha hadn't have been a Heart Healthy baby then I would have been ready to go home 6 hours later. But her's is the birth that upsets me the most. The last few weeks of a pregnancy usually drag as you patiently wait to meet your new arrival. The last six weeks of my pregnancy with Martha went way to fast for my liking. Not only was I nearing the end of my pregnancy but potentially nearing the end of my time with my precious third child. Usually, when you arrive at the hospital to have your baby you have all the excited thoughts "Next time we walk out of this building we'll be taking our baby home with us". My thoughts were, next time I catch the train to leave London - my baby might not have made it and I'll be going home with empty arms and a heavy heart. It was two weeks before my due date and I was nowhere near ready to give birth so I needed a pessary to get things going and told that unless I felt something sooner - they would be leaving me alone for 24 hours. I prayed and prayed that nothing would happen; when the twinges started a little over 12 hours later I tried my best to ignore them and played them down. When the midwife offered to give me an internal exam I refused and said that I wanted to wait for the full 24hours. When the 24hours was up I was already 2cm's dilated and my waters were broken - I knew then that it wouldn't be long. 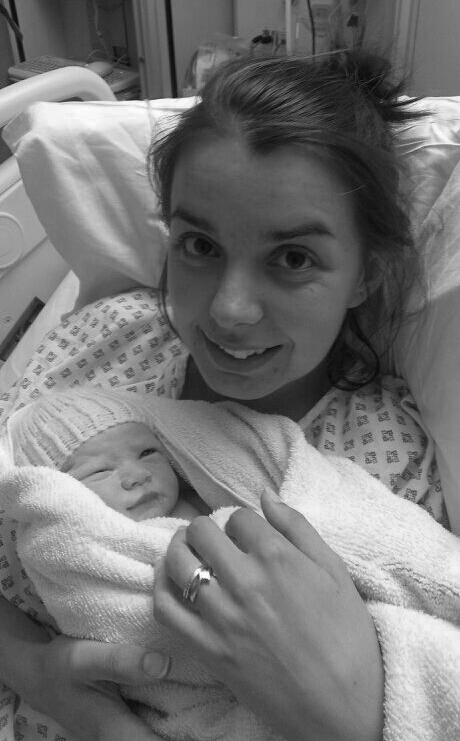 At 7:05pm I could feel the pressure and I knew that my body wanted to push, but I ignored it - but half an hour later I knew I couldn't ignore it anymore and I alerted the midwife - she got all excited and went out to find everyone that we needed in the room with us for Martha to be born safely. Doctors, Paediatricians and Consultants flew in and waited over the Cot while I delivered the Baby. As she entered the world at 7:53pm she was handed over the team while they did their checks - I had to ask Mark how she looked because I hadn't even caught a glimpse of her - I'd only heard her cry. There was time for a quick photo and that was it. Less than 10 minutes after she was born she was making her way across the hall out of the Labour ward and into the NICU. I got showered and changed and waited for the epidural to start wearing off. It was 11:30pm before I got to see her; in an incubator with a feeding tube passed through her nose and ECG leads attached to her chest. That night I slept in the antenatal unit because I knew that seeing the other new Mothers with their Babies asleep in the cot next to their bed would crucify me. I woke at 7:30 the next morning and made my way back across the hall to visit my baby, I didn't know much about Hospitals back then and hadn't realised that it was shift change time...the nurse told me off and I started to cry. I didn't stay long and went back to the antenatal ward to wait for Mark and my Mam. There weren't any congratulations cards next to my bed, Osh and Isabella couldn't come to visit and neither did anyone else that 1st weekend. I didn't want anyone to see her - I was too scared that Martha wouldn't make it. 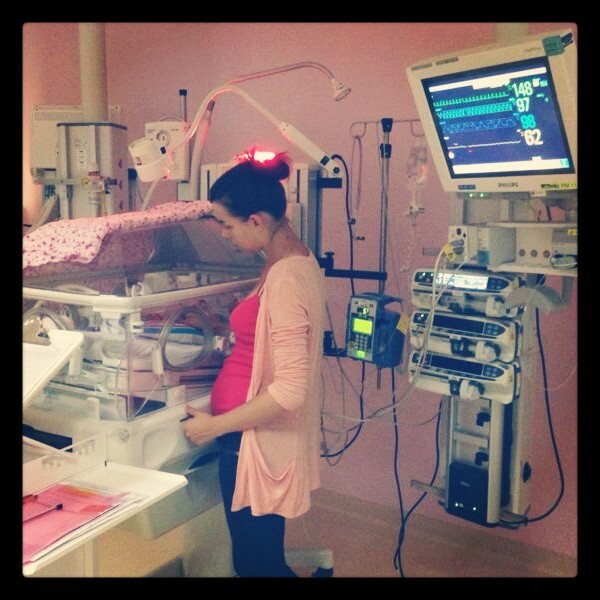 I felt perfectly fine in the physical sense; I was back in my regular jeans walking around from the NICU to the canteen. I hadn't been discharged but I was out and about - we were in an Italian restaurant having dinner the night after Martha was born. When she was transferred to Great Ormond Street at 4 days old I walked from UCLH there. I told Mark's Nan that the only way I could cope on the day of the Operation was by walking around London she reminded me that I had given birth less than a week ago and that my Body still hadn't recovered. But my head had recovered; so much happened during the 1st week of Martha's life that I didn't have time to think about myself. Had Martha have been a Heart Healthy Baby I would have spent the 1st week of her life enjoying cuddles on the sofa surrounded by family and friends in a complete newborn haze. Instead, we were signing consent forms for an operation where the main benefit was to save her life - but the main risk was death! So while the Birth itself was calm - the experience on the whole was a very traumatic one.